This is where we need to enter branding into the equation. Unfortunately, many designers think of user interface as unrelated to branding or to paraphrase: not their problem. Branding is a broad ideal which encompasses a multitude of elements. This includes (but is not limited to) identity, usability, customer service, delivery, desirability, and follow-through. Your job tasks you with the responsibility to affect a significant number of these elements. If you hope to develop a top-notch user experience using interaction design you must understand that interaction is always with the brand. Any company that is interacting with customers has an inherent approach that permeates their whole business. This is the brand’s promise. I am not speaking of a written guarantee or a tag-line. The brand promise is not something to live up to but the zeitgeist of the business culture. It drives the purpose, the ideas and the passion of the organization. Everything about how a company does business constantly reinforces or creates these impressions. The smallest details and most subtle points can have incredible effects on the overall experience. For companies who only interact with their customers via Internet enabled websites, applications, and devices, it is crucial to understand how to imbue an effective brand promise into your interaction design. Designing interactions and guiding experience is more than interface design or usability tricks. Every piece of interaction will speak to the user. Every detail, every piece of marketing copy, image, icon, drop shadow, layout placement, or button contributes to the user’s associations and judgements about the company they are dealing with. Good usability or interface design doesn’t change bad offerings into good service. It is key that you align an interface design with the business. For example, if a website boasts top notch customer service, if the interface design makes it smooth and easy to get into contact with a representative, but the operator is rude and unhelpful, is the user experience still good? Of course not. The promise of good customer service did not align with the reality. In this case, it is much worse than just a leaving a bad taste, because now the user feels deceived and therefore unhappy with the overall experience they had. What this means for a designer is not that you should force your clients to do their job differently, but that you should strive to accurately communicate to the user what they will be getting. If you go into a fast food restaurant expecting cheap, unhealthy and good tasting food, then you will leave happier than if you expected a gourmet meal. Neither expectation is necessarily bad but the overall experience is affected by the expectation and how it relates to the promise. There are elements of branding and ultimately of user experience that are simply out of your hands as a designer. However, designers certainly have the ability to make powerful strides toward better user experience with purposeful design, aesthetic execution, and thoughtful attention to detail. Design is problem solving. Whether its interior design or interaction design, your job as a designer is to build an effective solution to a specific problem. When you spend the time and effort to build purpose into your design, efficient and effective interfaces are born. After all, human ingenuity is all about purpose. Some of today’s greatest inventions such as the Internet were born out of purpose and slowly realigned to fit other needs and to solve new problems. Many people consider aesthetics and utility to be mutually exclusive. In fact, they are inter-dependent elements and are both extremely influential on interface design and user experience. Aesthetic design in and of itself is extremely full of practicality and reason. The powerful nature of attractiveness is such a clear part of human nature and yet is so often overlooked, prioritized and shirked. Aesthetic nature is a visual tool for humans to evaluate the world around them. When so much of how we understand our world is based on how good it looks, it’s not prudent to tell ourselves that to be beautiful is secondary. Whether or not our minds consciously tell us this, we thrive on attractive features. The smallest most subtle details can mean the difference between attraction and repulsion. Every day, we evaluate relationships, food, people, information, materials and more solely on how they look. Of course, we continue to build our knowledge of these things by interaction and record. This helps form our evaluation around this knowledge to understand our experience with it. A web interface or application is no different, so why would we skip the essential first step in the process? Dedicating effort to details and subtle features may seem tertiary to our objectives to create usable interfaces and good experiences, but sometimes the little things can mean the most. When you spend time on the details you do more than spend time or make something look better, you communicate care and genuine passion. This is so valuable just because no one wants to deal with someone who hates their job or doesn’t care. They know that apathy will translate to how well they are served. Conversely, when you do care and express passion it begins to contribute to the user’s experience by enhancing any decent or acceptable experiences to wonderful and fantastic experiences. With interface design, we do not have a chance to meet our users or explain the passion the business may have. But, we can help communicate and evoke these feelings by spending time on the details. Quick, think of all activities and situations that you enjoy on a regular basis. What did you think of? Enjoying a night with friends? Relaxing? The morning coffee? You don’t have to think to hard to realize that humans are wired to enjoy the simple and easy. However, many people confuse simple with basic. They are not the same thing, and that is where a lot of designers trip over the concept. Simplification should equate to clarity not lack of usefulness. We do enjoy the simple things, but we also seek out function and productivity. The aim is to boil a task down to the most straightforward and least confusing method. Building a simple interface is not about treating your user like they are inept. It is about clear communication, context and follow-through. 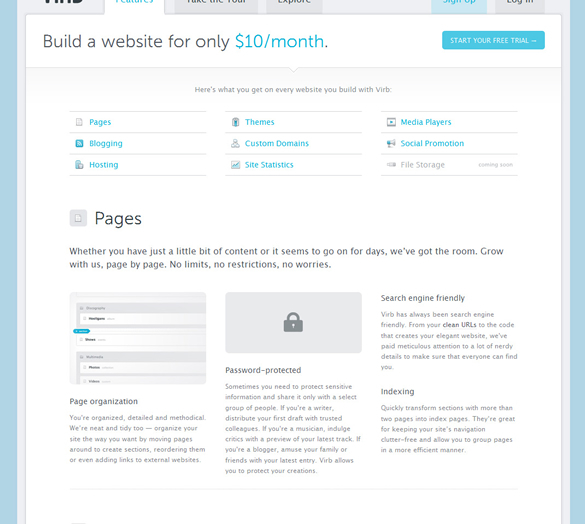 Let’s look at an example of a site that uses clear design and contextual simplicity to create great experience. In the example above, the task of uploading a file and sharing it is clear and straight-forward. All of the design has purpose, clarity, and aesthetic execution. Even the speed lines serve to focus the user attention on the name and logo. This is more than just vanity; it builds context. 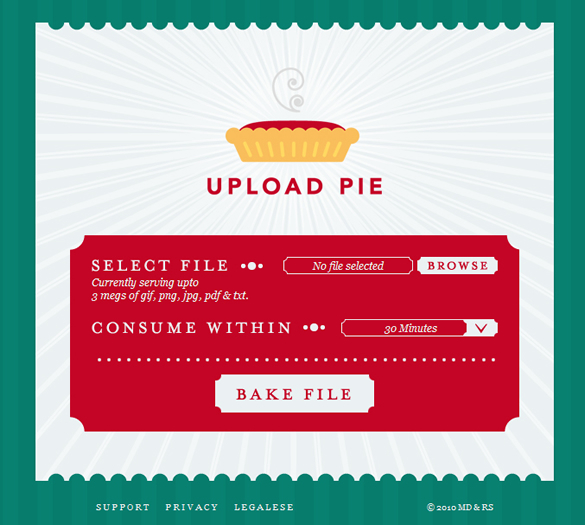 Without the addition of the “Upload” part of pie, it may take the user additional time to understand what this site is for. The simplicity of this design is not insulting or pandering; it is concise , pleasant, and useful. Sure, the Upload Pie design is usable, but that was only half the battle of creating a good user experience. Don’t believe me? Above, I have copied the layout and function of Upload Pie, but I have removed everything that contributed to the branding. This includes the name, marketing copy, graphics, colors, button styles, divider and icon style, font choices, backgrounds, and…well, you get the point. Will it work the same as Upload Pie? Sure it will. But, notice that when you focus too much on building a usable design, it will sacrifice personality. To many designers, personality and character would be the last element they addressed in user interface design. This is strange because it is so important. Don’t agree? When was the last time you called a large company and were excited to listen to the automated responses and phone menus? I would bet never. Do you enjoy robotic greetings or a form letter from your insurance carrier? Probably not. We are people and we enjoy interacting with other people. When you create a site design with quirks, details and attractive snippets, you add branding and personality into your design. This imbues it with value and pleasantry. In short, you build better user experience by making it both useful and enjoyable. In both brand design and interface design you should strive to be clear. People don’t like surprises and don’t enjoy being confused. The first step to better user experience is to start the conversation right. Why is it good/effective/worth it? In the examples above, our questions are addressed immediately, quickly and clearly. This allows the user to know what the website is about and now they are primed to have a positive user experience, even if they don’t use the service or product. Hierarchy is basically about how we order and rank information based on priority and importance. This is an important element of building a solid and usable experience. Good hierarchy should make it easier to find the important things. There much more to be said about hierarchy, however the main point here is to never make it hard to find the most important functions and tasks. Most people don’t enjoy being in a long line or a crowded room. When you breathe and have your personal space, it helps you be more comfortable. Interface elements are no different. All elements need their own space to be usable, convey a message, or assist interactivity. Sure, some elements can overlap, but when content is all smashed together it simply makes it hard to click, difficult to read, and forces the user to do more mental organization than is comfortable. In this example, we can see how every single element has a comfortable amount of white space around it. This makes sure that even though there is a decent amount to read. In other words, it doesn’t feel daunting or confusing. This results in a comfortable feeling and contributes to a pleasant feeling for the user before they even have to read anything on the page. As I have been mentioning, the key to good user experience is generating pleasant, non-confusing and comforting situations for the user. But, what does this mean for actual usability design? Usability inherently means a measure of the ability for a user to use something. But how do we do that? We make the user comfortable by creating pleasant experience, using familiarity, and not being confusing or annoying. I have read possibly hundreds of lists of usability tips, mistakes, and tricks, yet they all seem to boil down to the same thing: don’t make it hard for your user! I know, I know, it’s not that simple right? Most of what contributes to a good user experience is simple design and clear ways to interact with the brand. Before you spend to much time on building a design or analyzing its usability just ask yourself: how well are you supporting the brand promise and how simple and clear is the interface? If you can focus on simple usability, great user experience will follow. Very useful for me, I get the point about branding design…. Once again another amazing article! Retweeting now…. Great post Shawn, especially the Communicate Value points. Thanks for posting this. Great article, thanks :) Love to read about branding. Super article with stellar points, Shawn. Indeed, user interface is a key part of a business’ brand. I recall helping staff at an organization sort through their web content, prioritizing and cleaning up information. One of the individuals started complaining how much work was involved. I explained a few hours of work on our end would helps tens of thousands of their visitors complete tasks quicker and easier, making it a worthwhile investment. Being lazy about things and letting visitors fend for themselves is bad business. hello.Thanks for posting this article. A very useful one for me. Thanks for the mention, appreciate the kind words too. A stellar article all around. Excellent points on the simple/basic distinction in particular. I’m surprised to hear you say that “most designers think brand is not their problem.” That is not a stereotype my experiences support at all. In fact, most interaction designers I know consider the user experience the “embodiment”, if you will, of the company and it’s brand. So, I obviously agree with this fabulous article and am hoping that stereotype really doesn’t exist! and I agree with Cassy above. This trend is indeed very common. Great article. I have to also agree with Cassy and Neeraj. This trend is hot right now! Great Article. Just wanted you to know we liked your article so much we created a blog on our site to explain how this relates to our customers and mobile applications. We have linked to your blog, you can see our post here: http://www.newdogtech.com/blog. We look forward to following your posts. Great article, especially the Communicate Value points. Thanks. Branding, is an art and it is the hardest thing on the planet to devise a campeign that will be successfull. I have been working for over 3 years on various campeigns for MajikPocket, with little success. I am convinced that only piles of cash and specialized connections are the key.